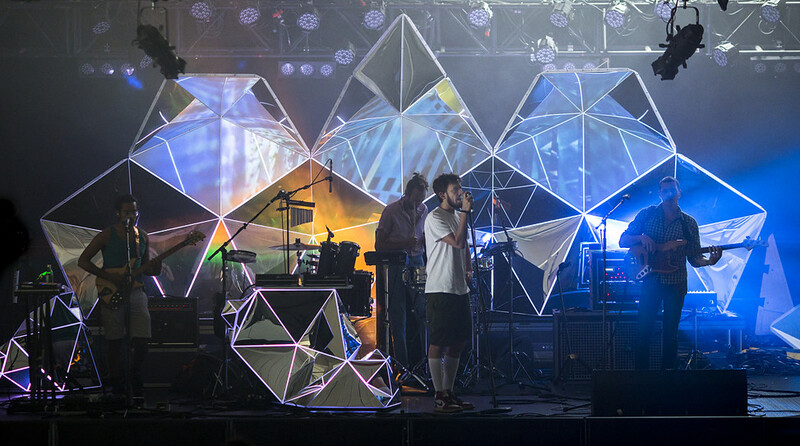 In the summer of 2012, the artist Casey Reas asked ArandaLasch to collaborate on the design of an immersive stage environment for Yeasayer’s Fragrant World tour. Reas’ creative direction imagined the stage as a crystalline laboratory and communication hub where visual signals reflect, refract and combine with the music to collapse the physical environment of the stage in on itself. ArandaLasch designed a set of mirrored crystalline instrument tables along with the stage backdrop that served as a kaleidoscopic projection surface for custom visuals designed by Reas, Yoshi Sodeoka and Aaron Meyers, all orchestrated by projectionist Nick Gould. The project was commissioned by the Creator’s Project.